Historical (yellow) and current (orange) distribution of the Cimbrian and Mócheno dialects. The earliest record of the movement of Bavarians to Verona dates to ca. 1050 (Bayerische Staatsbibliothek Cod. lat. 4547). The settlement continued during the 11th and 12th centuries. A theory of Lombardic origin of the Zimbern was proposed in 1948 by Bruno Schweizer and again in 1974 by Alfonso Bellotto. The debate was again revived in 2004 by Cimbrian linguist Ermenegildo Bidese. The majority of linguists remain committed to the hypothesis of medieval (11th to 12th century) immigration. The presence of Germanic-speaking communities in Italy was discovered in the 14th century by the Italian humanists, who associated them with the Cimbri who arrived in the region in the 2nd century BC. This is the likely origin of the current endonym (Zimbar). An alternative hypothesis derives the name from a term for "carpenter", cognate with English timber (lit. "timberer"). 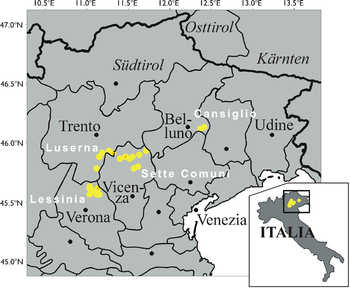 In Trentino, according to the census of 2001, the first in which data on native languages were recorded, Cimbrian was spoken by a majority in the municipality of Lusérn (267 people, 89.9%). In other municipalities of Trentino 615 persons declared themselves members of the Cimbrian linguistic group, a total of 882 in Trentino. With this, it is seen that the Cimbrian's most thriving variety is that of Lusern with most of the community able to speak Cimbrian, whereas in Giazza and Roana only a few remaining older speakers remain. Cimbrian is officially recognised in Trentino by provincial and national law. Beginning in the 1990s, various laws and regulations have been passed by the Italian parliament and provincial assembly that put the Cimbrian language and culture under protection. School curricula were adapted in order to teach in Cimbrian, and bilingual street signs are being developed. A cultural institute (Istituto Cimbro/Kulturinstitut Lusérn) was founded by decree in 1987, whose purpose is to "...safeguard, promote and exploit the ethnographic and cultural heritage of the German speaking minority of the municipality of Luserna while paying special attention to historic and linguistic expressions, to the protection of the environment, and to the economic-cultural development of the Cimbrian community territory." The cultural institute hosts literature competitions for children as well as immersion summer camps. The following description of Cimbrian grammar refers predominantly to the dialect of Lusern. All dialects of Cimbrian use different orthographies though all are mainly based upon Italian and German orthographies with some additions from other languages and do not drastically differ. Diacritics and graphemes common in German and other languages are mostly utilized for sounds that do not exist in Italian. Diphthongs are written as in Italian whereby, for example, drai 'three' is written in contrast to the German Drei but is pronounced the same. [k] is rendered as in standard German as k while the grapheme ch is reserved for the sound [χ]. In the Thirteen and Seven communities, [g] is rendered as in Italian - g (which goes to [dʒ] before e and i). If [g] is to be kept before a vowel, the writing must change to gh. In Lusern, [g] is rendered mostly as g, perhaps due to more familiarity with German in Lusern. Though, seeing ghe and ghi is not uncommon. Nouns in Cimbrian, as in German and other German dialects, have three genders - masculine, feminine, as well as neuter. Cimbrian makes use of the nominative, dative, and accusative cases. The genitive case was formerly used but has now been replaced with the use of the dative + vo ('of'), a similar case which can also be seen in modern German. Cimbrian nouns inflect for gender, case, and number, usually keeping the same patterns for even Italian loanwords ending in -a, - o, and -e. Nouns also have forms for diminutives. Cimbrian articles (both definite and indefinite) have long and short forms depending on stress. Examples of Cimbrian noun inflection (with long articles and German counterparts) can be seen below. Note: å is equal to an open back unrounded vowel. Cimbrian verbs are inflected for person, number, tense (present, past, future), mood (indicative, subjunctive, conditional, imperative, infinitive, gerund, and participial), and voice (active, passive). In regards to conjugation, Cimbrian shares many aspects with many other upper-German dialects. As in these other dialects, the use of the preterite has been replaced by the perfect which is formed with the prefix ga- (vallen ‘to fall; gavallet 'fallen’). Infinitive verbs have two forms, a simple infinitive as well as a dependent infinitive which is formed with zo. An example of this can be seen with the verb 'to fall': vallen - zo valla. In the Cimbrian of Lusern's present indicative, 1st person plural as well as 3rd person plural are both formed in the same manner as the simple infinitive, just as in standard German. Thus vallen acts as the infinitive, 1st person plural, and 3rd person plural. The 1st and 3rd person plural also match each other in other tenses and moods. Cimbrian, in most sentences, uses SVO ordering, similar to Romance languages, however, in some cases it adopts some German word ordering. The vocabulary of Cimbrian is closely related to that of Bavarian, containing words that set it apart from any other German varieties. Although today many Bavarian words in Bavarian communities are used less and less due to the influence of standard German, in Cimbrian many such words have remained. Besides its original Bavarian vocabulary, Cimbrian has been affected by Italian as well as neighboring languages. from his intoxication and began to let the machine gun rattle. Während des Krieges wehrte sich die Festung von Lusern vortrefflich. das Maschinengewehr knattern zu lassen. Pan khriage dar forte vo Lusern hat se gebeart gerecht. is se darbkeht dar trunkhante soldado un hat agehevt z'schiasa. ^ Corresponds to /s/ in the Sette Comuni dialect, where this phoneme does not exist. ^ "UNESCO Atlas of the World's Languages in danger". www.unesco.org. Retrieved 2018-01-14. ^ Hammarström, Harald; Forkel, Robert; Haspelmath, Martin, eds. (2017). "Cimbrian". Glottolog 3.0. Jena, Germany: Max Planck Institute for the Science of Human History. ^ a b c Coluzzi, Paolo (2007). Minority Language Planning and Micronationalism in Italy: An Analysis Of Friulian, Cimbrian, and Western Lombard With Reference To Spanish Minority Languages. Oxford, Bern, Berlin, Bruxelles, Frankfurt am Main, New York, Wien: PeterLang. pp. 224, 226, 227. ISBN 978-3-03911-041-4. ^ "Kulturinstitut Lusérn". www.kulturinstitut.it. Retrieved 2016-04-14. ^ a b c d e f g h Tyroller, Hans (2003). Grammatische Beschreibung des Zimbrischen von Lusern. Stuttgart, Germany: Franz Steiner Verlag. pp. 9, 15, 17, 33, 49, 124, 199. ISBN 3-515-08038-4. ^ Martalar, Umberto Martello; Bellotto, Alfonso (1974). Dizionario della lingua Cimbra dei Sette Communi vicentini (in Italian) (1st ed.). Roana, Italy: Instituto di Cultura Cimbra A. Dal Pozzo. ^ a b Tyroller, Hans (1979). Lusern: die verlorene Sprachinsel. Kulturverein Lusern. p. 41. Baum, Wilhelm (1983). Geschichte der Zimbern. Storia dei Cimbri (in German). Landshut: Curatorium Cimbricum Bavarense. Schmeller, J. A. (1855). Cimbrisches Wörterbuch (in German). Vienna: K. K. Hof- und Staatsdruckerei.